Alva, the Wayfarer crossed many lands in search of a cure for Saint Serrata's sickness. His armor is light but durable as he spent much of his time travelling. When he was travelling Zullie, the Witch used all manner of tricks and deceit to ruin him, but he would not be distracted from his task. When he failed to find a cure for Saint Serrata's sickness he relinquished his knighthood. Saint Serrata was a cursed undead. Alva swore on his knighthood to find a cure. Alva's journey seems to mirror that of the undead who travel from land to land searching for a cure. Just like many of the undead, no cure was found, and Saint Serrata hollowed. Alva realized his quest had failed and relinquished his knighthood. Wracked with guilt and remorse he found comfort with Zullie, the Witch. Alva rediscovered his purpose, perhaps to find a cure to the curse for the sake of others, and he and Zullie spent their lives together, she supporting his endeavors. 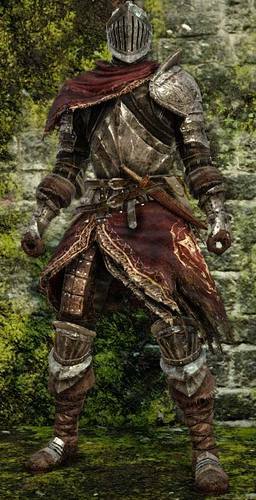 Armor worn by Alva the Wayfarer. Light but offers very high defense. Alva crossed many a land in search of a cure for Saint Serreta's sickness, but failed and relinquished his knighthood. Alva was once wracked with guilt and remorse, but rediscovered his purpose in life with the aid of the witch who once plotted against him. Robe worn by Zullie the Witch, seducer of Alva the Wayfarer. Boasts excellent magic defense. When Zullie the Witch learned of Alva's dedication to Saint Serreta, she used all manner of tricks and deceit to ruin him, but in the end she would spend her life with him, supporting his endeavors. The witch, as unloving as she was unloved, finally found illumination through her blighted existence.